This week has been quite a contrast to last. Where I had been stressed to the limit with teenage angst & scrapes squeezed in between the most delightful catch ups with long ‘lost’ friends, I made the conscious decision this week not to continue along that path. I realise that tight deadlines and running against the clock are no longer for me, no matter how well and energetic I feel! This week does however have several rather nice events, along with a parents evening and all the usual gubbins running a houseful entails. I decided therefore to leave plenty of time between leaving home and meeting my 17 year old at his college for the parents evening. As I turned off the A371, less than a mile from home I spotted a woman, who I thought was one of my son’s friend’s mum, blackberry picking along the side of the quite dangerous bit of road. As I drew alongside, she turned to me and stuck her thumb out. In a split second I decided to throw caution to the wind and give her a lift. I didn’t know her after all & my guest explained that she needed to get to Barton St David, which was more or less on my way to Street. Having just arrived back from a course in Totnes, she explained that she was an MA student from Vermont. On returning to the car, my guest was holding one of my Kate Bush CDs and exclaimed how much she loved that particular album ( Arial) but had never before seen the physical package with its beautiful illustrations. How excited that made me, an opportunity to not only play the cd but also to share the memories of our life changing experience of seeing Kate Bush sing live last year at her ‘Before the Dawn’ concerts. I then had to put fuel in the car was happy to leave my guest sitting in the car listening to the cd. After ticking off two of my errands we set off towards Barton St David. It turned out that she actually needed to get to Glastonbury and pick up her bicycle, but would really like to drop her bag off first. Happy for me to drop her in Street and walk the last stretch to the Red Brick Building, she was very pleased and grateful when I offered to take her to her bike. It wasn’t a huge detour for me, I knew the Red Brick building, it was a beautiful afternoon, and I still had plenty of spare time. I hadn’t driven through Barton St David for many years. It’s a very pretty Somerset village, right on the edge of the Levels. Plenty of Willow trees and lots of views of the Tor. As I drove I asked about her life, where she lived, her studies and plans. I was so pleased to hear she was from Santa Fe, the very same town I had got to know fairly well during my time there with SPIN (Silk painters international) in 2006 and 2008. It was an opportunity to recount my adventures across the desert near Georgia O’Keefe’s Abiquiu , to the Monastery in the desert, such happy memories. 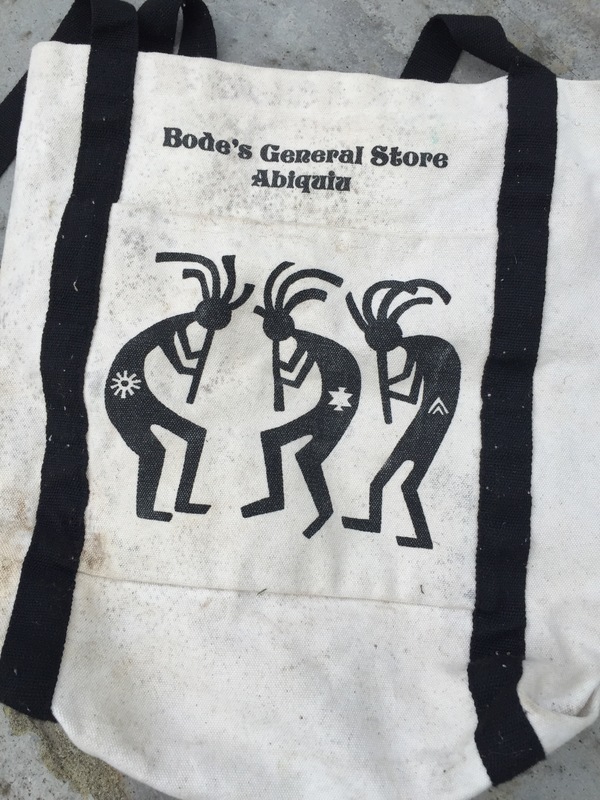 We also shared my joy of owning a ‘Bode’s General store’ canvas bag. As a student of psychotic episodes, she had been traveling in South Africa, her plan was to set up a centre of traditional African medicine, combined with dance. It needed vast sums to get off the ground so her MA was more about connections and raising the funds than simply studying. Since our journey I’ve remembered reading about traditional African medicine and how differently , and more successfully, they treated mental illness. Their basic belief was that most mental illness occurred due to the soul of the individual being possessed by a spirit and that the person was chosen as a vehicle for messages from ‘the other side’ to be passed on. These chosen few would therefor be cared for extremely well and their delusions listened too under the guidance of Shamen. There was a study done where some clinically psychotic American patients were shipped to an African village for treatment. It turned out that they recovered quicker than expected and returned to a completely normal existence afterwards. I wish I’d remembered this during our drive, it would have been fascinating to discuss it with her. We talked about Africa, my experience of Bush Men in the Khalahari and her knowledge of Botswana and Cape Town. Her bag was dropped off down a small track near some craft workshops. She was staying in a field owned by some friends. She wasn’t sure how much love Niger to stay here. Having spent most of recent years living in Thailand with her now ex boyfriend. Free to go where she pleased I assured her that we were due a week or more of sunshine and so staying in Somerset with her bicycle wouldn’t be too dreadful! We arrived at the Red Brick Building and said our farewells. Her name was Bethany and with her blonde hair, clear thin pale skin and piercing grey eyes we had a moment of taking each other in. So much more could be talked about, a brief collision of our life’s paths, probably never to meet or even hear of each other again. So many shared loves, Kate Bush, New Mexico, Bodes store in Abiqu, Africa & healing. I watched her walk behind my car towards the buildings, then after reversing back to pull away, I looked again and she’d vanished. Completely vanished. Her disappearance was so sudden that I could even question that I’d seen her at all. It made me think of those stories of old hags knocking at doors asking for food, turning out to have been a profit of some kind, testing the generosity and godliness of the host. I suppose I will never know , but I did look up the meaning of her name on my return… Bethany a small town near Jerusalem where Lazarus & the sisters Mary & Martha lived. If an Angel was to be in disguise, would Bethany be her name I wonder? Then again, maybe I was her Angel? Love this story. Well done, as usual. Thought of you when I wrote it Roberta, fellow believer of Angels!